A maam-maid! Yaay! I am the fairy Princhessh! Ain’t those words ringing in your ears? Why not gift your little baby pie with her swimming tail. Let her enjoy being the Little Mermaid. Enjoy watching her delve into making waves with her beautifully designed mermaid dress with eye-popping hues. With those twinkling eyes and her charismatic charm, see her breaking the blanket rule and creating a beautiful bow décor that will create her own world. Open the box of surprise! “Oh my god! Mammaid dresh!”, happiness leaves no bounds when little princess utters those words with sheer joy. Your baby pie transforms, becoming the mermaid of her own world! 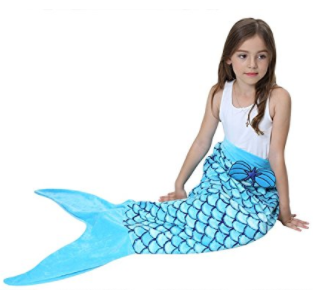 This mermaid tail is going to be the dream satisfaction of your little princess when she transforms herself into the prettiest little mermaid. Snuggling up on the couch to taking it do various travel and campaigning locations, little mermaid is weaving her own story. From winter mornings, autumn evenings to spring nights, your little mermaid is going to shoo away the coldness and welcome the warmness. And what about the summers? Of course, you little one knows how by being a little mermaid she can skidoo the air-conditioning air. With super soft plush fleece double, the Camlinbo Mermaid Tail is gorgeously fabricated with mermaid fin. Your little cuppy-cake is interknitting her own fairy tale where she is the queen of her kingdom. Isn’t that a great opportunity to record her fairly tale moments! Appreciate her for looking so pretty and throwing happiness all around the house!